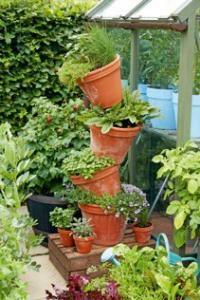 A tower of pots is a quirky and space saving way to grow your own! Growing your own has never been so popular, and it’s easy to see why. With supermarket prices increasing, and more people wanting to eat healthily and reduce plastic food packaging, growing your own makes financial and environmental sense. In very little space you can grow delicious fresh fruit and vegetables that don’t need to be shrink-wrapped and sat on a supermarket shelf for days. Plus with National Vegetarian Week coming up on 14th-20th May now is the perfect time to start growing your own. So why grow your own? Save money – Enjoy organic food at home without the price tag. Quality – Homegrown food simply tastes better. Great for health – Eating fresh fruit and vegetables means that you’ll be getting a wide variety of vitamins and minerals in your diet. Eat in-season – By growing your own you’ll always be eating in-season. Cut back on plastic – There’s no need for packaging when you grow your own, simply pick and eat! Minimise food miles – The only distance your food will travel is from pot to plate! It’s fun – It’s great to see what you can grow from a few seeds or a small plant, and growing your own is fun for children too as it teaches them where their food comes from. Growing your own is much easier than you might think. All you need is a few pots, a trough or wooden crate and some compost, or a small patch of soil. Then buy seeds or small plug plants from your local Squire’s Garden Centre and you’re ready to go! It’s easy to grow you own in a small space. 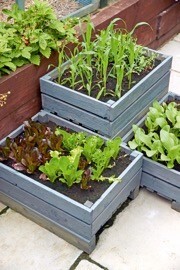 Try using wooden crates or a window box.